The Klamath River System is one of the most impressive drainages on the West Coast, starting in the vast Klamath Basin in southeastern Oregon and carving its way across Northern California’s rugged Siskiyou Mountains before emptying into the Pacific Ocean. For thousands of years, the water of the Klamath – as well as its native salmon and steelhead – has been an integral part of life for the people inhabiting the region, including the Karok, Yurok, Shasta, Modoc, Klamath, and Hoopa Indian tribes, as well as ranchers and outdoors enthusiasts. When The Fly Shop® opened its doors in 1978 the Klamath River was one of the primary guided angling destinations that we offered. In the years that followed the Klamath River System endured some tragic times, as the effects of decades of mining, trapping, logging, and agricultural irrigation left the waters in the river tepid and warm, drastically affecting the runs of anadromous Salmon and Steelhead that had once numbered in the millions (in fact, the Klamath River historically had hosted one of the largest runs of Chinook Salmon in the entire continental US). Although the Chinook Salmon run on the Klamath River has been nearly decimated, the Steelhead in the river have made a remarkable comeback in the past decade, and with recent litigation regarding dam removal there is a great glimmer of hope for the future. Once again, the Klamath is back! Included in your guided angling package on the Klamath River is 8-10 hours of guided fishing with lunch provided. The Klamath River is open year 'round to fishing most years, but the timing of the steelhead runs mean that certain times of year will be more productive than others. Also, warm water conditions can make the upper sections of the river un-fishable in the late summer months. The late spring/early summer season, from the time flows begin to drop around the end of May until the water grows too warm to fish by the middle of July, presents one of the most exciting dry fly fisheries in the region. Thousands of giant stoneflies – both salmonflies and golden stoneflies – hatch on the upper reaches of the Klamath during this time of year. The Klamath's resident rainbows in the section of river pod up in the riffles and near the willow-lined banks. Our guides drift the river, while anglers cast big dry flies to aggressive trout that average 10-14 inches, with fish over 20 inches hooked daily. The season can start on the lower Klamath as early as July, but the real season doesn't get started until sometime around the middle of August to the middle of September. There can be some great traditional steelhead fishing on the lower Klamath River during this early season, from the mouth of the Klamath upstream past Johnson's Bar and on towards the confluence with the Trinity River near the town of Weitchpec. Steelhead fishing on the Klamath in this early season is an exciting angling adventure. Anglers typically use jet boats to maneuver the river and access various riffles and runs that hold these early season steelhead. The primary technique is traditional swinging, with single or two-handed rods, using various floating lines, sink-tip lines and shooting heads. This is the way Steelhead are meant to be caught; once you've felt the tug of a chrome-bright fish at the end of a tight line, you'll be hooked as tightly as any fish. The Steelhead in this part of the river are fresh from the ocean, full of all the strength and ire of any saltwater species. They run in size anywhere from half-pounders to adults ranging up to 12 pounds. The so-called "middle Klamath" is the rugged, remote section of the river starting at Weitchpec and running upstream through Somes Bar, Orleans, Happy Camp, and the Seiad Valley. Highway 96 paralells the river through much of this section. There's a lot of fantastic steelhead water in this section of the Klamath, and not much angling traffic. In fact, our friends at the Marble Mountain Ranch are located smack dab in the middle of all of it, and usually have the river to themselves from early October through November. The portions of the Klamath River that our guide staff concentrate on begins at the Iron Gate Dam, just north of the town of Yreka and south of the Oregon border along the Interstate-5 corridor. There are several drifts in this upper region of the Klamath that our guides focus on during the late fall and winter months, targeting both half-pounders and adult steelhead. Starting around the middle of November, Steelhead start showing in good numbers in these upper reaches of the Klamath, and they'll keep coming until around the middle of March. These are strong, wild fish that consistently keep anglers enthralled with aerial acrobatics and long, powerful, reel-burning runs. The fish on the Klamath River are a mixture of "half-pounders" in the 16-20 inch range, and adult Steelhead that average 4-5 pounds, with fish up to 10 pounds landed each year. In the colder fall and winter season (November through February), our guides prefer to drift nymphs under indicators in the upper Klamath, as they have found over the years that we've been guiding this river that it is far and above the most productive way to catch fish during the winter. The upper Klamath River's deep pools and channels are ideal for dead-drifting nymphs. 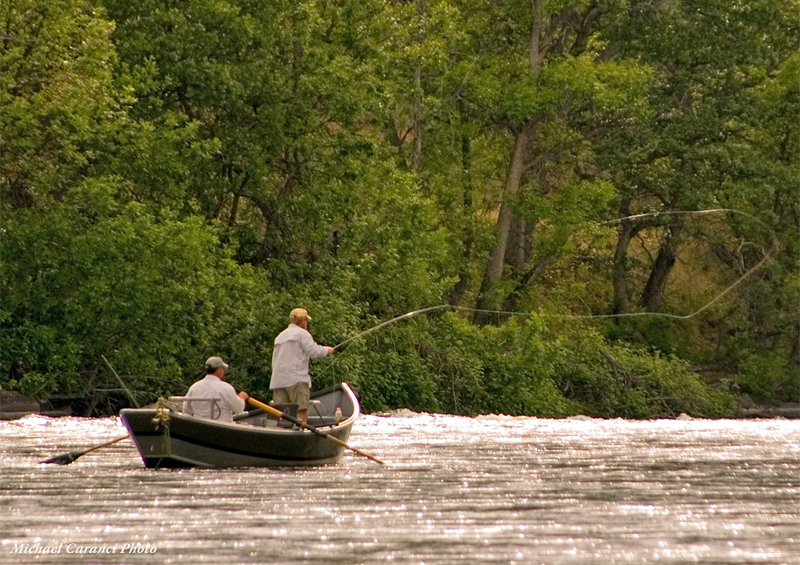 Our guides fish this stretch of the Klamath in comfortable drift boats. There is very little wade access between Iron Gate Dam and Interstate 5, so drifting these sections of river is the most effective way to cover the water and find the fish. 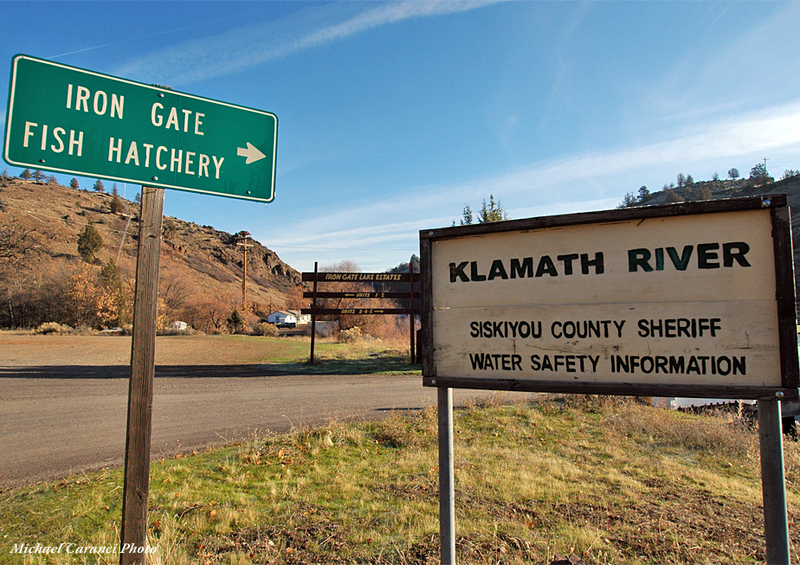 The Klamath River is perhaps best known for its historical runs of half-pounder steelhead. than good chance of hooking some fish, and more likely than not they'll have chances of hooking good numbers of steelhead on any given day. 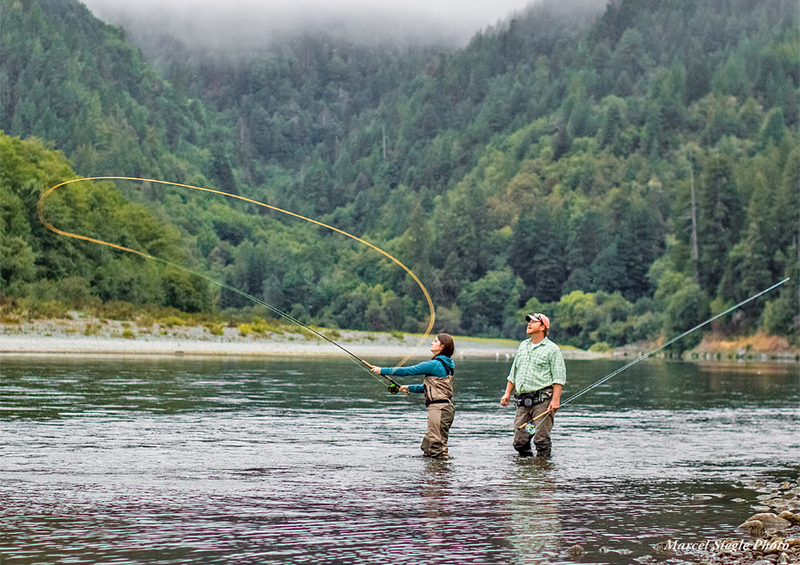 There are two main techniques used to fly fish for steelhead on the Klamath River: Swinging flies and nymphing. Swinging flies is the most traditional method to target steelhead, and can be effective in the lower and middle sections of the river during the early season (August-November) when water temperatures are warmer and the steelhead are more active and aggressive. In the colder fall and winter season (November through February), however, our guides prefer to drift nymphs under indicators in the upper Klamath, as they have found over the years that we've been guiding this river that it is far and above the most productive way to catch fish during the winter. The upper Klamath River's deep pools and channels are ideal for dead-drifting nymphs. The portions of the Klamath River that our guide staff operates on begins at the Iron Gate Dam, just north of the town of Yreka and south of the Oregon border along the Interstate-5 corridor. There are several drifts in this upper region of the Klamath River that our guides focus on during the late fall and winter months, targeting both half-pounders and adult steelhead. They also fish this same section of river in the late spring/early summer, targeting resident trout on big dry flies during stonefly hatches. Our guides fish this stretch of the Klamath River in comfortable drift boats. There is very little wade access between Iron Gate Dam and Interstate 5, so drifting these sections of river is the most effective way to cover the water and find the fish. Indicator nymphing is the predominant strategy, working the deeper holes where the large Steelhead congregate. There are a few minor tributary streams entering the Klamath River in these upper few miles, yet the river remains largely controlled by releases from Iron Gate Dam. The Klamath's water always has a dark tea-color tint to it, but the river generally remains fishable in the upper floats throughout the winter months. Big winter storms may blow the river out, but it clears quickly, usually in just a few days' time. Most of the drifts that our guides cover on the Klamath River are 1.5 hours north of The Fly Shop in Redding. As a result, our Klamath River anglers have the option to stay either in Redding or in the Yreka area. If you'll be enjoying an extended stay in the region, staying at one of Yreka's cozy motels or nearby campgrounds may be you best option, while if you're considering multi-day trips to our other regional streams Redding makes for a great centralized jumping off point. 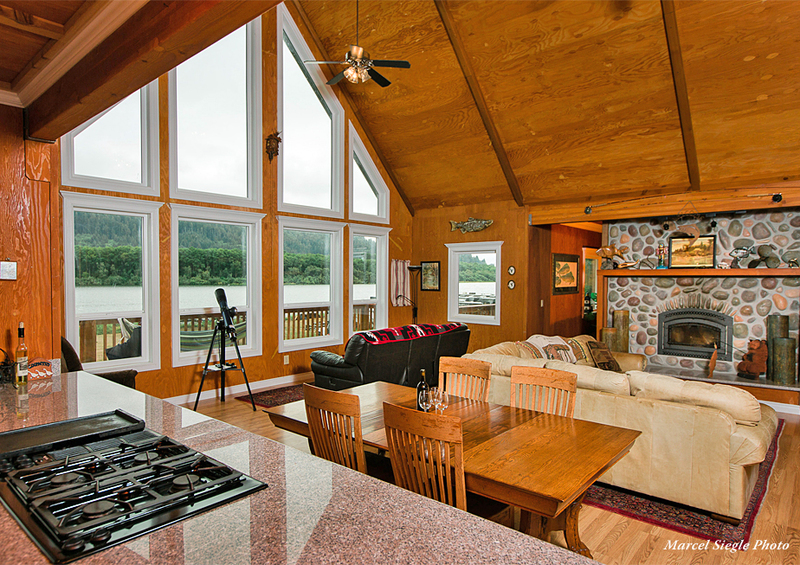 • The Marble Mountain Ranch has rental cabins available, as well as meals and guides, in the middle sections of the Klamath River. 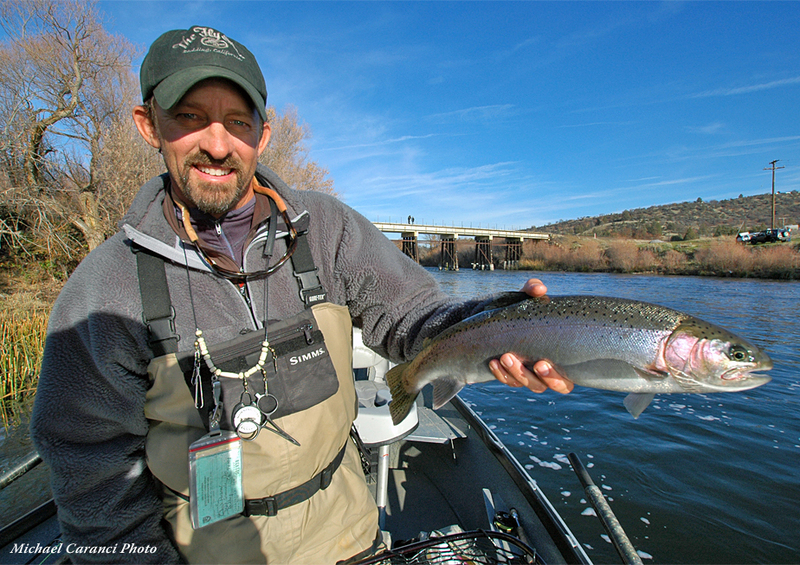 • The Super 8 in Yreka has been a favorite for wintertime Klamath steelheaders for years. Clean, fair pricing, with Casa Ramos' great Mexican food and margaritas right across the street. • Located right on the Klamath River, the Blue Heron RV park is a great spot for campers or RVers, and even offers some rental options. Fish Hook Restaurant is right there for tasty meals, too! The Upper Klamath River near Iron Gate Dam is where we do most of our guiding on the Klamath. This section of river is about 1 hour, forty minute drive time north of Redding, or about 30 minutes south of Ashland, Oregon. Interstate 5 (Exit #789) north of Yreka. To get to the Upper Klamath from Redding, travel North on Interstate 5 for approximately 110 miles, then take Exit #789 towards Henley/Hornbrook. Turn right onto Ager Rd (which turns into Copco Rd), and the Chevron station will be on your right. If you continue on this road heading east, it will parallel the river and take you to Iron Gate Dam.